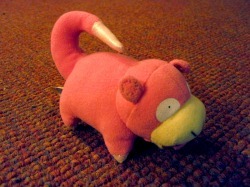 This one's probably my smallest Slowpoke plush that I have. He's about 2.5" in length, and 2" in height (tip of the tail) with a round magnet on the inside of his tummy! He's plump, airheadded, and never really knows what's going on, but at least he can hang onto metal! Purchased from Purr's Pokemon Palace. They measure 4" (including tail) long and 2" tall. I think there is another plush just like this, except it is by Hasbro and has a plush zipper instead of a metal one. I'm still on the lookout for it. I was really shocked when I saw this plush about a year ago, and I didn't think I'd ever own it. First off, he's quite rare, and.. a leather plush? That's just weird! He was my mini-grail for a while, but I didn't even know how amazing this plush was until I got to hold it in my hands. Sure he may be made of leather, but he is very smooth, and fun to squish! The leather just adds a beautiful texture, and I was amazed at how flexible the leather was (and how it wasn't old and peeled or anything.. leather tends to do that with age). 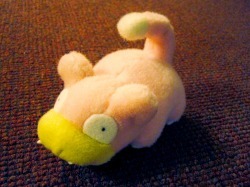 Oh Banpresto, how I love you for making such an incredible plush..
Why are Slowpoke plush so hard to find? This one took forever to track down, and I didn't even see one on Y!J, but one day it suddenly popped up on eBay (however, it wasn't cheap ;___;). I eyed it for a few months before I finally caved in and made the purchase, but I don't regret it at all, since I still have yet to see another one up for grabs anywhere. The one I have is missing hang tags, but at least his fur is basically mint and his tush tag is still in tact! The material didn't flatter me in the picture I saw online either, but I didn't know how squishy he was until he arrived in my mailbox! 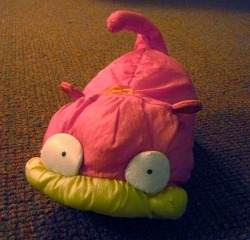 The bubble mailer he came in was almost flat, and I didn't think there could possibly be a plush in there lol. The material he is made of is a little shiny, and he is lightly stuffed and very easy to compress. Unfortunately, the one I have is not in the best condition (but not in the worst, either!). His eyes began to peel a little, since it's what happens to that material with age (it looks like it's coated in very thin plastic), and more of that material rubbed off on my hands when I lightly touched his eyes, so I'm starting to wonder if there is one out there in really good condition, since it's a very old plush (from 1998). 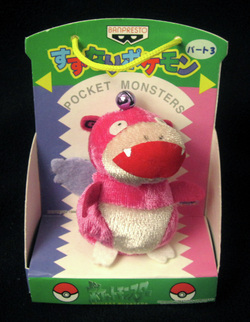 This plush originated in the UK, and compared to some of the others, was fairly easy to obtain. 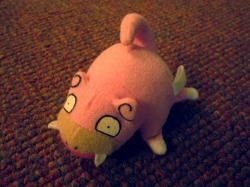 Overall, it's not the most common plush out there, but I'm still glad to have one in good condition with his tush tag! He is 3" tall and 5" long, with shiny white fabric used for his feet and tip of his tail, and the perfect yawning face (his mouth is gaping open lol). SO ADORABLE AND TINY. I had no idea how small bell plush were.. this was my first. I wouldn't have settled for anything but a MIB with this one, because I know I'd just be on the constant look-out for one in better condition otherwise!